Suuri huoneisto hiljattain remontoitu! Alakerta Erinomainen sijainti vain 100 metrin päässä merestä. Löydät kaikki palvelut, joita saatat tarvita loman aikana. supermarketit, ravintolat, kahvilat, apteekki ... Wifi: Siinä on nopeita optisia kuituja ja yksityisiä televisiokanavia (Movistar Plus). Päämakuuhuoneessa on oma kylpyhuone, jossa on 1,35 m sänky, 2 makuuhuonetta, joissa on 1 vuode 90cm, sekä vuodesohva olohuoneessa viidennen vieraan. Toinen kylpyhuone suihkulla, täysin varusteltu keittiö, olohuone, ilmastointi ja sisäpiha pesukoneella. Se on alue, jossa työskentelee kannettavien tietokoneiden (pöytä ja mukava tuoli) kanssa yhdessä yksittäisessä makuuhuoneessa. Miellyttävään oleskeluun tarjoamme sinulle huoneiston, jossa on kaikki mitä tarvitset, kuten vuodevaatteet, pyyhkeet ja peruspalvelut. Täydellinen oleskelu pariskunnille, perheille ja ystäville, jotka haluavat harrastaa vesiurheilua, kuten surffausta, leijalautailua ja purjelautailua. Kenellä ei ole kokemusta vesiurheilusta? Älä huolehdi Médanosta, sillä kouluissa on erilaisia hintoja, joiden hinnat ovat johdonmukaisia. Aloita seikkailu ja varaa lomasi. Stayed for 30 nights Feb/Mar2019,very comfortable stay.The apartment has everything one needs.Its very central close to all the shops bars-restaurants and bus stop highly recommended.The hostess Antonia contacted us twice during our stay to ask if we were OK,a welcome pack on arrival fruit snacks and Prosecco and of course the fantastic Canarian climate.High speed wifi allowed us to stream UK tv.This was our fourth stay in El Médano since March'18 and was the best apartment so far. 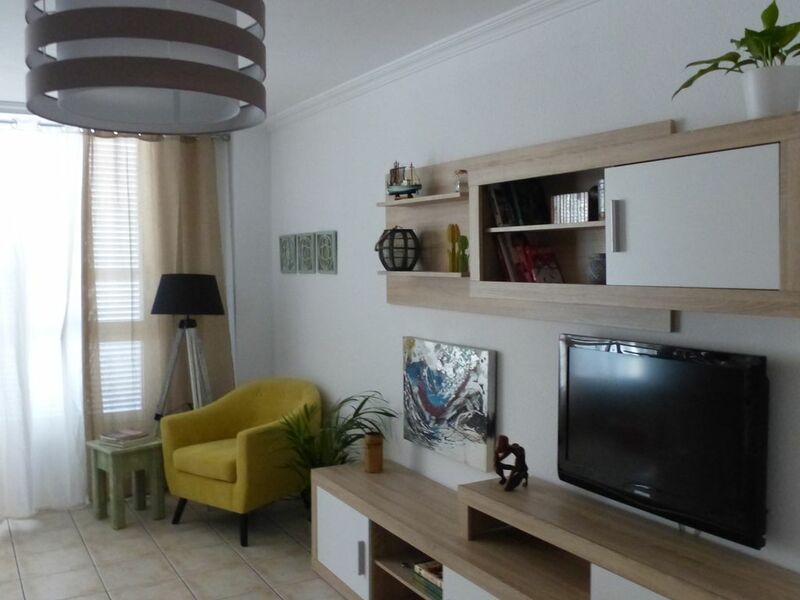 Wonderful apartment, very well equipped. A warm welcome from Antonia and a wonderful starter pack. The location was great and a car is not necessary as everything was close to the apartment. Thank you very much Lesley and David. I hope you come back soon. Antonia was at the apartment to meet us and show us around. Everything was spotless with all we could need. The position was excellent close to shops, restaurants and the sea. We would go back anytime! Thank you Linda! I hope you come back soon. Antonia was a good host who responded quickly when contacted, she met us at the apartment on arrival and let us stay until the afternoon on departure day. The complimentary breakfast tray and wine were a lovely touch. The apartment is stylish, spotlessly clean and the beds are very comfy with memory foam matteresses. The location is brilliant - just a few minutes walk to shops, beach and square with plenty of supermarkets and good restaurants within a short stroll. All 3 bedrooms have windows that open onto a semi covered courtyard/ utility room that is accessed through the main bedroom, so they do not have much natural light (the comfy beds make up for this !) There is no outside space. The apartment is very well equipped with everything you might need - including beach towels. Thanks for a lovely stay Antonia. Thank you, Lorraine! I am glad you enjoyed the stay in the apartment. I hope they come back in the future. Apartment is very nice and a perfect location for all amenities and beach. Antonia is the perfect host. We were greeted at the apartment although we arrived late. The apartment is great, very clean and comfortable. Location is also great close to all amenities and the beach. El Medano is a great place nice and quiet with very friendly people.I would recommend highly the apartment. Thank you Antonia and best of luck for the future. Vesiurheilu, kite surfing, surffaus, purjelautailu, purjehduskoulut, melonta, golf, retkeily. Hyviä ravintoloita, joissa on kansainvälisiä ja paikallisia ruokia.